Let’s talk about your wedding venue dear readers. Have you got a certain style in mind, but just can’t seem to find something that feels like you? Or hasn’t been seen everywhere? Well, you are in for a real treat, because not only have we blogged about the Top 15 Urban Wedding Venues and in case you missed them, the Top 15 Country Wedding Venues and the Top 15 Coastal Wedding Venues, today we have the last instalment in our running venues roundups, our fave 15 heritage style wedding venues. There sure is something for everyone – from quaint and cute to heritage style with a country twist and then full-on, old-world glamour… Heck, there’s even a castle you can get married in! We’ve also covered capacity – everything from intimate weddings to the average size (say hi Rippon Lea House & Garden and The Refectory) all the way up to venues that can handle a 500 strong guest list (we’re looking at you Abbotsford Convent!). So go and make a tea, get comfortable and make your way through the list. We’ve linked to their websites, our Directory (for those venues we know and love) and real weddings that we’ve blogged featuring the venues and first-hand reviews from the happy couples. You’ll also find loads of wedding venue inspiration in our latest issue (issue 24) so hot off the press, it’s exclusively in newsagencies until Thursday and in our online store after that. You’ll find your nearest local stockists here. You’ll also see incredible venues from all over Australia (and the world) in the 2019 Real Wedding Special that we launched last month. The impressive Hopewood House is a stunning estate, found in the Southern Highlands, south of Sydney. It’s the perfect setting for a black tie event, complete with crystal-adorned chandeliers, a marble fireplace, library, expansive balconies and glorious gardens. This venue is about as romantic and luxe as they get when it comes to heritage style, look and feel. There is seating for 150 guests, award-winning catering and you can see it in action for Courtney & Kieran’s wedding we blogged a while back, or head straight to their Directory listing that you’ll find here. Queensland peeps, listen up! Check out Gabbinbar Homestead, stat. 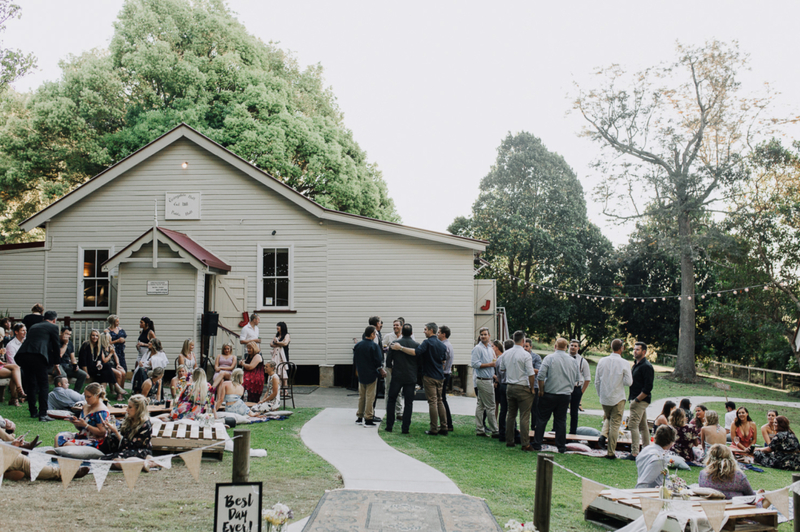 It’s a country Queensland venue (just under two hours west of Brisbane) that has been around for almost 150 years, functioning as a wedding venue since 2012. A fully-fledged estate with multiple options for ceremony and reception, from a gorgeous set-up in the woods, to the conservatory with lush garden views, a ballroom and stables. It’s ten minutes from Toowoomba CBD where there is accommodation for days, too. Handy. Don’t miss Rhoda & Roland’s nuptials, one we blogged, as well as printed. Yes, it’s that good. A charming church built back in 1958, the talented team from Prunella (florists) are responsible for this incredible venue. Have your wedding at Churchill and it’s quite possible you and your guests will feel like you’ve flown to Europe for the day. It oozes luxury and glamour, while also boasting a raw, rustic feel – no mean feat. You’ll find four beautiful weddings on our blog, all with their own unique take on this venue and we love every single one of them. We can’t get enough of Audley Dance Hall. It’s in the middle of the Royal National Park in Sydney’s south and you’ll feel like you’re hours from the city when you arrive, although it’s a mear 45 minutes from the CBD. The Heritage-listed venue is in the middle of a garden oasis, holds up to 200 guests and features a verandah overlooking a picturesque river. It’s worth heading to the cafe for brekkie or lunch to check out the spot, but first, take a look at the multiple real weddings held here on Audley Dance Hall’s Directory listing with us and the quaint cottage where brides can get ready in our Spring Fling fashion editorial we blogged on the site. Location: Audley, NSW. Another Bursaria venue, (meaning exquisite food and service), Abbotsford Convent is located on the Yarra River and holds up to 500 guests (cocktail), so allows for a big and beautiful wedding like no other. Specifically the Rosina Function Space, you’ll find heritage style architecture (we’re talking original, stained glass windows here and high ceilings to boot! ), an incredible courtyard and an original Bluestone chapel. It also has galleries and eateries on site, a community hotspot for the cultured. Contact them via our HM Directory here and see Ren & Drew’s real wedding on the blog for more. New Zealand brides, don’t miss this guy. Old Forest School is made up of a number of buildings restored to all of their former glory from the 1930s and now couples are lucky enough to get married there. You can tie the knot anywhere from the schoolhouse to the barns, stables and sheds, even out under the 80 year old trees. There is cabins on site for accomodation and charm on tap. Catering for intimate nuptials, but also parties of up to 200, Rippon Lea House & Garden provides 14 acres of National Heritage listed grounds, including gardens, lawns, a pool and lake, all complimenting one seriously epic ballroom, of course. Originally built in 1868, it’s got rich history and luxury finishings and boy is it worth a look if heritage in every sense of the word is your vibe. Cocktail can accommodate up to 250, too. Bonus! Check out their Directory listing for more. Keen to get married in a castle? Look no further, friends. St Josephs Guesthouse and Function Venue is a restored Church – 160 years old in fact! And is three levels of glorious old-world glamour. It can hold up to 60 people for your wedding, and has accommodation, too, so you can settle in for the weekend. You’ll find it was the incredible venue for Claire & David’s wedding that we ran on the blog and they may as well have lived their very own fairytale that day. Don’t miss this unique spot, famous in Tassie for its organic Apple Cider, found just 25 minutes South of Hobart in the Huon Valley. Willie Smiths Apple Shed is on the more casual end of heritage style, featuring gorgeous grounds and wooden buildings with cute quirks for countless photo ops. The food is all sourced from local produce and the venue can seat from 100 to 200 standing and you can check them out at their next Sunday session where you’ll be amongst food, music and their tasty beverages made on site. It will also make for a fun one to regularly visit and reminisce on your wedding day. Just a short drive (30 minutes to be exact) from Melbourne, The Refectory, that is found within Werribee Mansion, has major wow factor for your big day. There are multiple options for the ceremony location, allowing for classic heritage style feels, from the immaculate grounds to the majestic grand staircase, its architectural aesthetic is second to none of the old world era. Head to their Directory listing with us to find out more. This is not one to miss, folks. Ewingsdale Hall is cute, charismatic and has a historic church on site, too, as well as ceremony options under the countless fig trees or on the clean-cut lawns. Located in the Byron Hinterland, it was built back in 1908 and is basically a blank canvas with white walls and wooden floorboards, ready for you to add your style and flair in a flash. We love what Laura & Bryce did with it for their big day. Yes, we’ve chosen the iconic Vaucluse House, but Sydney Living Museums Venues actually looks after six Sydney wedding venues that are all Heritage-listed and equally as awesome to hold your wedding at. Sporting elegant sandstone, colonial-style architecture, majestic buildings and grounds to rival Downton Abbey’s, the venues are rustic but refined and well worth a look. You’ll find all of their venues listed on their Directory listing here. Stop everything WA peeps, this venue literally lists on their website that they have “no restrictions or guidelines regarding catering, drinks or set up.” Surely that’s music to most couple’s ears! Perth City Farm has The Barn (with exposed beams lining the roof- perfect for hanging lights or florals- whitewashed walls and lovely plain flooring – no carpet here, friends!) so it’s easy to style in your own unique way. Then there’s the Art Room and an outdoor courtyard allowing for spaces and packages to suit any budget. They also host community events, tours, workshops and a farmers market. What more could you want? Another epic venue from across the water in the ever-impressive New Zealand is Sudbury. Incredibly transparent about costs and what it includes at first glance on their website (very handy!) they even offer BYO alcohol with no corkage! Bonus! You’ll have access to gorgeous locations for your pics, and the hay barn, garden bar, courtyard gardens, stables and even an outdoor fire. But you were sold at the no corkage anyway, right? This place is the perfect mix of country and heritage, built in the 1890s and now partnered with a pavilion on the two-acre property. As part of the Spring Hill Peony Farm, you can buy the beautiful blooms directly from the venue (come Spring) or simply walk down to the paddock for your portraits. Capacity is 80 with the added option of setting up a marquee on site. If you’re keen on a wedding in Western Australia, check out one of the oldest pubs in the cool, calm and casual Fremantle, the Ball & Chain, a genuinely historic building (built in 1836) that housed the very first convicts to arrive in Fremantle in 1850. That’s some pretty serious history, right? Restored and just really darn cool, you’ll love the look, the feel, the beer, and the outdoor area, we’re sure of it. CREDITS Photos (From top) Gui Jorge Photography, Lucy Sheedy, Beck Rocchi and Brown Paper Parcel, Alice Mahran and Tones & Harmony, She Takes Pictures He Makes Films, Danelle Bohane, Blumenthal Photography, Zoe Morley Photography, Agapé Media House, Scott Surplice and Stefani Driscoll, Carly Tia Photography, Anna Turner Photography, Through The Woods We Ran, Tim and Nadine, Marnie Hawson Weddings, Ball & Chain.